The usual sales price of this fan is £84.95 + vat but we are clearing our remaining stock of these at £45.90 + vat. Other sizes also on sale. Grab a bargain whilst they are still available!. These reversible fans help prevent overheating in stop-and-go traffic. Improves fuel consumption, and performance (compared to mechanical fan). Ultra thin design allows fitment in cramped locations. Reinforced glass filled polypropylene blade and plastic housing minimise weight. Includes nylon mounting tie kit. 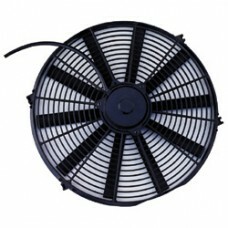 Diameter: 16”, Thickness: 4”, Motor RPM: 2000, AMP draw: 9, Fuse size AMP: 30, CFM: 2100.